A cursory reading of Matthew 24 can bear this out if you accept that it means what it plainly says—and that you can understand plain words correctly. 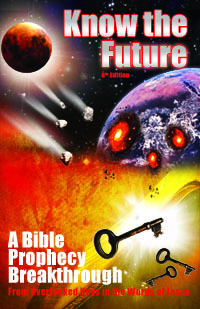 Read the chapter and note that Jesus does not mention the rapture until the very end of it (Mt 24:29-31). Before that, many other events are mentioned (Mt 24:3-28). Some of these have been fulfilled already, such as wars and rumors of wars (Mt 24:6). It even says at one point that until several events happen, “the end is not yet” or “the end won't come right away” (Mt 24:6-8; Lk 21:9-11). These next events in the timeline of the Olivet Discourse are called “the beginning of sorrows.” In a previous article I covered what these sorrows are . Given that as the reliable trend for thousands of years, I would not be surprised to see this war tarry another five years or more (2015 and beyond). After all, how long does it take to develop a nuclear arsenal from scratch when you are watched by the IAEA and have sanctions against you ? I've heard it said every year that some Arab nation has a bomb or will have a bomb this year or next, but an arsenal that you can reliably deliver is not so fast and easy to develop.